Treat yourself to the amazing scent of gardenia one of the most fragrant botanicals on earth. Indulge in Gardenia's potential to calm, relax and refresh. 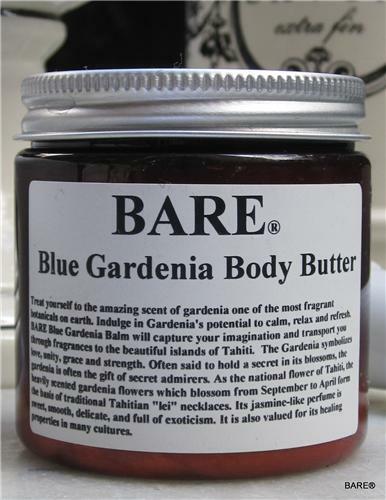 BARE Gardenia Balm will capture your imagination and transport you through fragrances to the beautiful islands of Tahiti. The Gardenia symbolizes love, unity, grace and strength. Often said to hold a secret in its blossoms, the gardenia is often the gift of secret admirers. As the national flower of Tahiti, the heavily scented gardenia flowers which blossom from September to April, form the basis of traditional Tahitian "lei" necklaces. Its jasmine-like perfume is sweet, smooth, delicate, and full of exoticism. It is also valued for its healing properties in many cultures. Being a southerner by birth, the BARE Gardenia Body Butter offered deep skin conditioning with a hint of glorious gardenia. Ahhhh, it was nice to visit the first time and is still nice to refer to.